Adam Smith’s contribution to economics is well-recognised, but in recent years scholars have been exploring anew the multidisciplinary nature of his works. 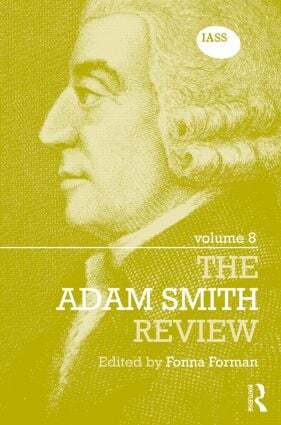 The Adam Smith Review is a refereed annual review that provides a unique forum for interdisciplinary debate on all aspects of Adam Smith’s works, his place in history, and the significance of his writings to the modern world. It is aimed at facilitating debate between scholars working across the humanities and social sciences, thus emulating the reach of the Enlightenment world which Smith helped to shape. The eighth volume of the series contains contributions form a multidisciplinary range of specialists, including Fonna Forman, Ryan Patrick Hanley, Dionysis Drosos, Matti Norri, Adelino Zanini, Cesare Cozzo, Estrella Trincado, Michaël Biziou, Carsten Herrmann-Pillath, Heinrique Schnieder, The Right Honorable Gordon Brown, Gavin Kennedy, Iain McLean, Vernon Smith, Alan Lopez, John Thrasher, Tom Martin, Brian Glenney, Şule Özler, Paul A. Gabrinetti, Craig Smith, Michelle A. Schwarze, Edwin van de Haar, Farhad Rassekh, Lauren Brubaker, Gordon Graham and Eric Schliesser. Fonna Forman is Associate Professor of Political Science and Founding Co-Director of the Center on Global Justice and the Blum Cross-Border Initiative at the University of California, San Diego, USA. She is Editor of The Adam Smith Review on behalf of the Adam Smith Society.